In recent years, expectations for control systems with wireless communications are increasing in the process control market. There is also an urgent need for the development of new field wireless devices and field wireless system devices to activate the growing field wireless market and promote the use of field wireless systems in large areas. Yokogawa has developed the CENTUM VP R5.02 distributed control system (DCS) and the OPC server for field wireless devices, both of which integrate field wireless devices. This paper introduces the functions and characteristics of the communication interface of host systems, focusing on the CENTUM VP. 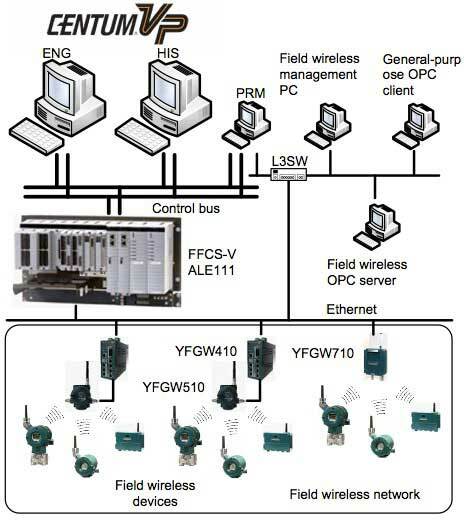 To meet these expectations, Yokogawa developed the CENTUM VP R5.02 distributed control system and the OPC server R2.0 (OPC: object linking and embedding (OLE) for process control) to integrate field wireless devices that conform to the ISA100.11a standard, the industrial automation wireless communication standard proposed by the International Society of Automation (ISA). The CENTUM VP has functions for monitoring the status of field wireless devices and for bumpless output, and achieves process control wirelessly which was conventionally achieved only in wired control systems that typically use 4-20 mA signal communication. Furthermore, the reliability of process control can be improved by utilizing redundant configurations. This paper introduces the functions and characteristics of the field wireless communication interface of new products, focusing on the CENTUM VP. Figure 1 shows the system configuration. The YFGW410 offers a gateway function to connect with a host system and a system manager function to set up and manage field wireless networks. It connects with field wireless devices via the YFGW510. The YFGW510 connects the YFGW410 with field wireless devices. The YFGW710 offers a gateway function and system manager function, and directly connects to field wireless devices. The field wireless device conforms to the ISA100.11a standard. This PC sets up and manages the entire field wireless network. The FCS (FFCS-V), HIS and ENG offer control, operation and monitoring, and engineering functions for the CENTUM VP, respectively. The ALE111 communicates with the YFGW410 or YFGW710 by using the YFGW communication function. This communication function can obtain and set data in field wireless devices via the YFGW410 or YFGW710. This OPC server obtains and sets data in field wireless devices via the YFGW410 or YFGW710 after receiving requests from its clients. This OPC client is a client computer that supports OPC Foundation client functions. It sends requests to the field wireless OPC server for reading or writing data in field wireless devices. The PRM is an integrated asset management software package. It monitors and diagnoses field wireless devices online. 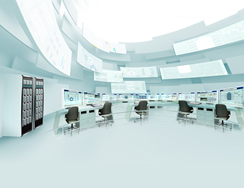 Yokogawa developed the YFGW communication function which enables communication between the CENTUM VP and the YFGW410 or YFGW710, and the field wireless OPC server. This paper introduces the functions and characteristics of the respective communication interfaces, focusing on the connection to the newly developed YFGW410. The basic functions of the YFGW communication function are as follows: communicate with the YFGW410, obtain and set the data in field wireless devices by using the Modbus/TCP communication protocol via the YFGW410, and detect abnormalities in the field wireless devices and then send alarms to the HISs. Those HISs display the alarms on the operation and monitoring screens. Table 1 shows the basic specifications of the YFGW communication function. For data updating, the YFGW communication function can obtain data from 128 field wireless devices and send them to the HISs within one second. When connecting to a YFGW410, the YFGW communication function also offers an instrumentation engineering function equivalent to that of traditional analog communication. In traditional analog communication, each port of an analog input/ output module is connected to one field instrument and the data is obtained from or set to the field instrument. On the other hand, field wireless devices are managed by a YFGW410 based on their device tags and their parameters are assigned to a register in the YFGW410. The YFGW communication function can obtain or set up the data in field wireless devices by specifying their register number. 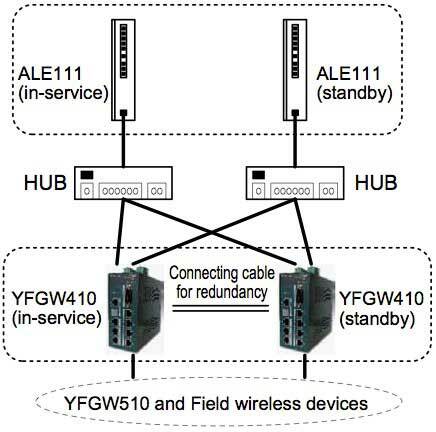 Even though ALE111 is physically connected to field wireless devices in the one-to-many system, the YFGW communication function can offer one-to-one connections with field wireless devices via a YFGW410 with the help of the software. For CENTUM VP to monitor the status of field wireless devices, the YFGW communication function uses the data status associated with the parameters of field wireless devices. The data status conforms to the ISA 100.11a standard and indicates the quality of data from the field wireless devices and the quality of the wireless communication. Table 2 shows the classification of data status. The YFGW communication function obtains the data status as well as the data itself from field wireless devices. When the data status indicates "bad", an identified trigger of abnormality will be sent to the HIS and the HIS will display an abnormality alarm message corresponding to the abnormality trigger and the abnormality alarm of the functional block on the operation and monitoring screens. When the data status indicates "good", normal data will be sent to the HIS. If it changes from bad, they display the data and a message that indicates recovery to the normal state. This procedure enables operators to not only monitor the statuses of field wireless devices and data quality, but to also easily identify abnormality triggers which are otherwise difficult to check visually, such as data disruptions or configuration failures. *1 The YFGW communication function processes the data status as either good or bad. *2 A new status defined by the Wireless Compliance Institute (WCI), an organization promoting the ISA100.11a standard. This status is used for the output read-back data. The YFGW communication function can also obtain the statuses of the YFGW410 and YFGW510 which are maintained in the YFGW410 independently, the remaining battery capacity of field wireless devices, and the self-diagnosis information in field wireless devices, and transmit them to the HIS. Thus, the operator can easily identify abnormality triggers by monitoring the status and self-diagnosis information of field wireless devices as well as monitoring other statuses. This function is helpful for maintaining field wireless devices properly for such tasks as battery replacement. The output parameters of field wireless devices with output functions are mapped to the YFGW410 registers. The YFGW communication function can write the results of control calculations in the FCS to corresponding registers in the YFGW410, and then transmit them to field wireless devices. This enables operators to directly operate field wireless devices from the CENTUM VP. Operators can also monitor the statuses and output values of field wireless devices because the YFGW communication function can obtain the output read-back data with data statuses of field wireless devices and transmit them to the HISs. However, when operating field wireless devices from the CENTUM VP, their output values should not change suddenly as in traditional wired systems, so the YFGW communication function appropriately stops and resumes output action to ensure bumpless output operation during restart. When the YFGW communication function stops writing to registers, the output to field wireless devices is discontinued. Even if any of the following failures occur, the YFGW communication function can keep a plant running safely by stopping writing to the registers and controlling the field wireless devices in a fail-safe manner. When a FCS stops abnormally, the CENTUM VP can no longer control the plant and the YFGW communication function will stop writing to registers. The YFGW communication function also stops writing to registers when it detects abnormalities in the wireless communication through the status data of the output read-back data. When a FCS is working properly, the YFGW communication function starts writing to the registers, or resumes output only when it detects the recovery of field wireless devices through the data status of the output read-back data. The YFGW communication function tracks the output read-back data, ensures the integrity between the output value and the results of control calculation, and resumes writing to the registers to achieve bumpless output operation. Through the status monitoring of field wireless devices and the bumpless output operation using the data status of field wireless devices, the YFGW communication function can achieve safe, easy process control in field wireless systems. With the redundant configuration of the ALE111 and YFGW410 as shown in Figure 2 , this control system delivers robust process control. If any failure occurs on the ALE111, HUB or between the ALE111 and HUB, the Modbus/TCP communication between the ALE111 and YFGW410 are disrupted and the YFGW communication function can no longer obtain or set the data in field wireless devices. In a redundant configuration, the stand-by ALE111 takes over control immediately after such failures on the in-service ALE111 or HUB. Thus the YFGW communication function can continuously obtain or set the data in field wireless devices through the original stand-by ALE111 a nd HUB. If any failure occurs on the YFGW410, the communication between the YFGW410 and field wireless devices is disrupted and the YFGW communication function can no longer obtain or set the data in field wireless devices. In the redundant configuration, the stand-by YFGW410 takes over control immediately after any failure described above occurs on the in- service YFGW410. Thus the YFGW communication function can continuously obtain or set the data in field wireless devices through the original stand-by YFGW410 because the connection between the original stand-by YFGW410 and field wireless devices has been established. When the redundant ALE111 or YFGW410 take over control or when any failure occurs in the stand-by ALE111 or YFGW410, the YFGW communication function sends a notice to the HIS. Therefore, operators can verify on the operation and monitoring screens that a redundant unit has taken over or that a failure has occurred in the stand-by ALE111 or YFGW410. With the field wireless OPC server, its OPC clients can monitor the operations of field wireless devices as well as evaluate their functions and properties by accessing their device parameters. This can promote the introduction of field wireless devices into plants. Figure 3 shows the connection configuration of the field wireless OPC server. 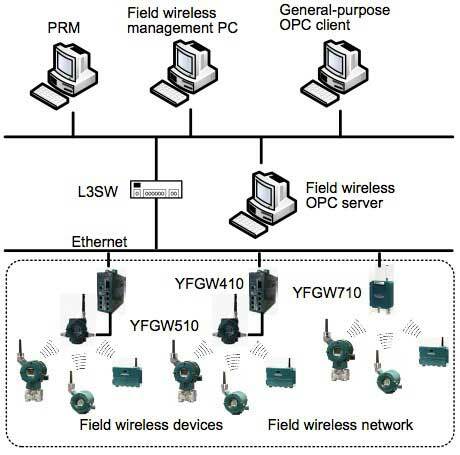 The field wireless OPC server, which is connected to the general-purpose OPC clients conforming to the OPC Foundation standard, receives requests from the OPC clients for reading or writing the data in field wireless devices and obtains or sets those data via the YFGW410. The features of the field wireless OPC server include a function to obtain and set device parameters in field wireless devices. The field wireless OPC server obtains the object information of field wireless devices from the capabilities files (CF) which describe the capabilities of field wireless devices and also obtains the parameter information of the respective objects from the device description (DD) files. The DD files created by Yokogawa have a common format for instruments and contain the parameters defined by the ISA100.11a standard and the WCI. The field wireless OPC server can obtain and set the parameters that are listed in the files. The field wireless OPC server achieves high-speed data transmission to OPC clients and provides highly reliable data so that they can correctly obtain and set large amounts of data including the device parameters in field wireless devices. The field wireless OPC server holds the obtained data in an internal cache. The server sends the data to the OPC clients only when the newly obtained data differ from those in the cache, thus reducing the communication traffic between the field wireless OPC server and OPC clients. The field wireless OPC server verifies the validity of the responses from the YFGW410 against requests from the OPC clients. It analyzes the responses and then sends the information to the OPC clients if any abnormalities are found. As wireless communication technologies continue improving, there is still plenty of room for developing and improving control systems with wireless communication, such as real-time process control for large-scale field wireless systems or monitoring the alarm information issued by field wireless devices. This paper introduced the YFGW communication function and the field wireless OPC server. We believe that these features enhance the development and improvement of control systems with wireless communication. Yokogawa will continue developing field wireless system products and continue its involvement in the ISA100.11a committee and in WCI activities to facilitate the development of and encourage the widespread use of field wireless systems. YFGW, CENTUM VP, and PRM are registered trademarks of Yokogawa Electric Corporation. OPC and OPC Foundation are registered trademarks of the OPC Foundation. Ethernet and Modbus are registered trademarks of XEROX Corporation and Schneider Electric SA, respectively.